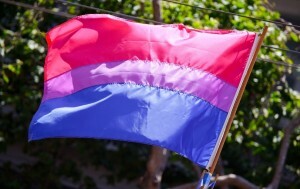 Did you know its Bisexual Health Awareness Month? 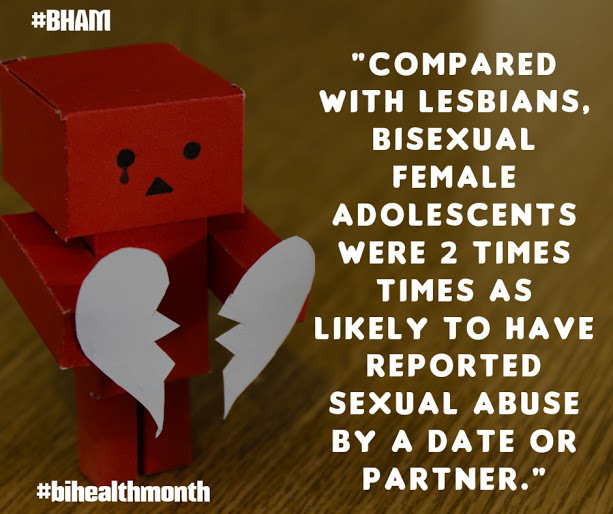 You probably weren’t aware but March is Bisexual Health Awareness Month (#BHAM). After a somewhat controversial episode of Loose Women at the end of last month spurring outrage on Twitter, we thought as a community organisation that works to promote inclusivity we would take a little look at the issue. 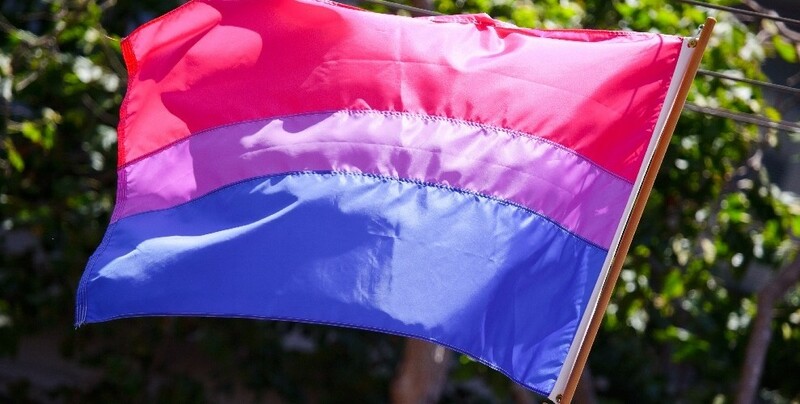 Bisexuality is thought of as the invisible part of the LGBT (Lesbian, Gay, Bisexual, Transgender) acronym, when Bisexuals actually make up the largest segment of the LGBT+ population. Bi people still experience a great amount of hostility and it is still very much a taboo despite increased campaigns to raise awareness. It has also become a lot more complicated with the advance of LGBT+. This is LGBTQIAP: Lesbian, Gay, Bisexual, Transsexual, Queer, Intersex, Asexual, and Pansexual – quite the headache. This month, charities and support organisations that work with the LGBT+ community are working to raise awareness about the unique health needs that face them. 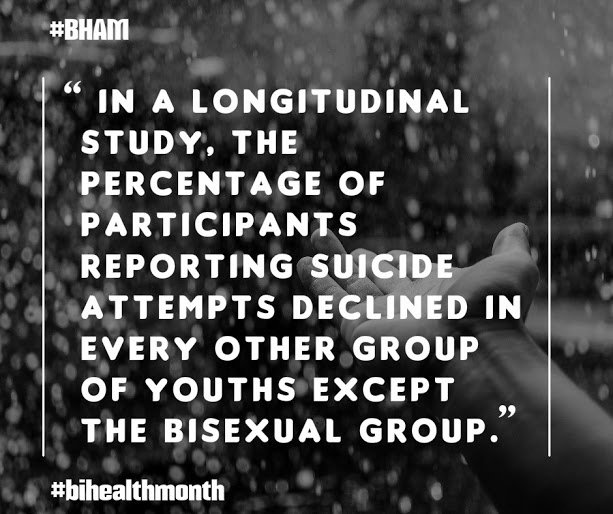 Bisexual people have poorer physical health, mental health, and higher rates of attempted suicide than Gay or Lesbian people. 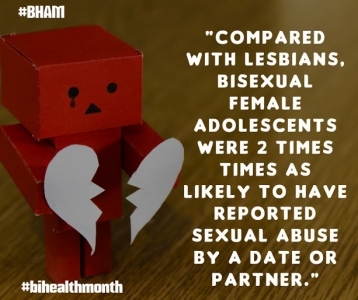 Bisexual people also experience higher rates of intimate partner violence and domestic abuse than heterosexual people. In my report on Neighbourhood Watch Engagement, and on provision for youths who have experienced Domestic Abuse, it was clear that organisations need to do more to acknowledge the specific needs of the LGBT+ population. The best way to start is to be aware of different types of sexual and gender identity, and to share that knowledge to combat ignorance. This time around the BHAM is focussing on the challenges that youth face in particular. 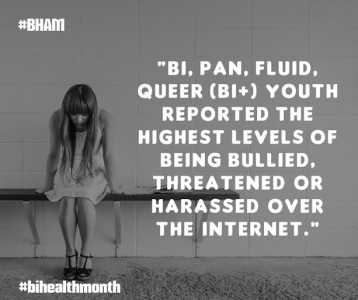 Young people face a huge amount of biphobia, face to face bullying, and cyberbullying if they chose to come out to their peers. 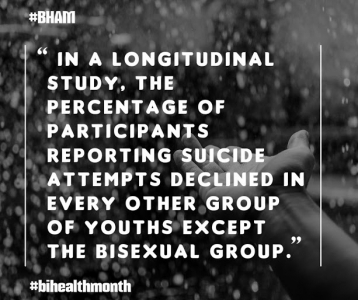 A report by the Human Rights Campaign highlights health disparities and related challenges of bisexual youth. In another report by the Human Rights Campaign, 37% of youth reported being harassed at school and 25% online. Here at One Community we have a Hate Crime Reporting Centre at Eastleigh Museum. Bisexual people and the LGBT+ community in general are more likely to experience bullying, harassment, and hate crime in its multiple manifestations. It is important that LGBT+ people know where to turn for help when they come up against prejudice. If you know someone who could use support in the Borough, give the Hate Crime Centre a call on: 023 8064 3026 or pop in to the museum. You can also find support with the Kaleidoscope Trust, or with Hampshire charity Breakout Youth.